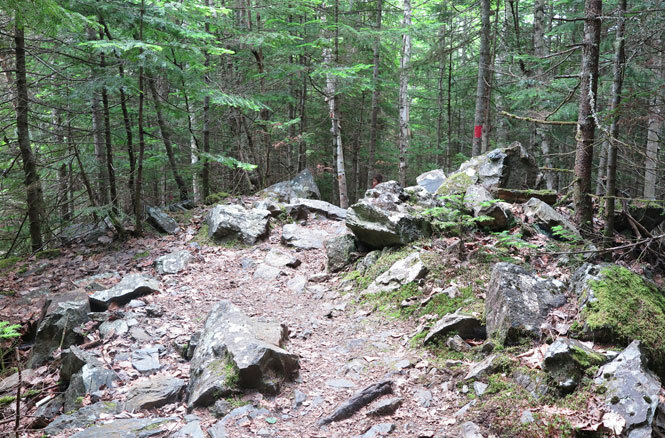 The Cascade Stream Gorge Trails are a great option for anyone in the Rangeley Lakes Region looking for a quick hike. 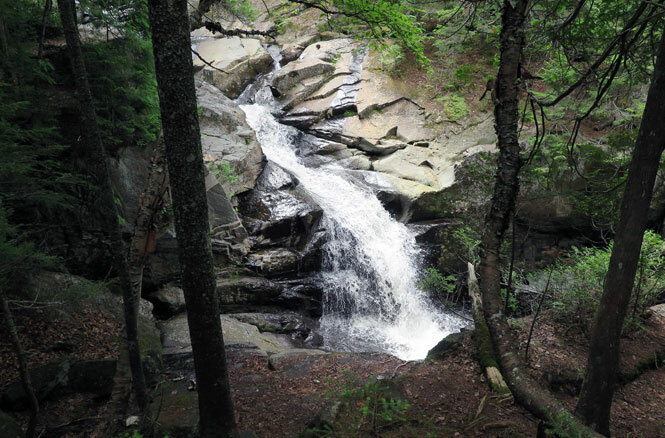 Eye candy is aplenty with gorge cliffs as tall as 90 feet and a stream dotted with waterfalls, the first of which is reached 0.2 miles into the hike. 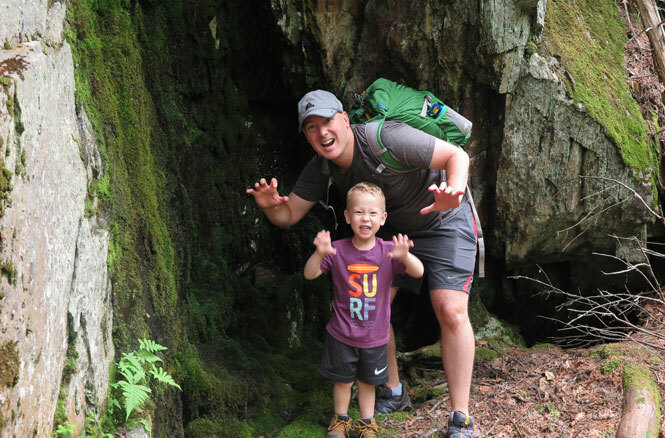 The trail is short with only a faint hint of climbing; however, it often traverses precariously close to the gorge, so families will want to have a favorable parent-to-child ratio to keep young adventurers safe. 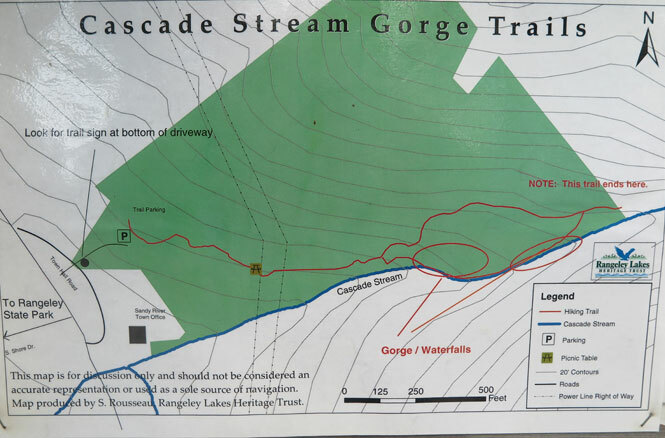 The Cascade Stream Gorge Trails map that’s displayed at the trailhead kiosk. Click to enlarge. 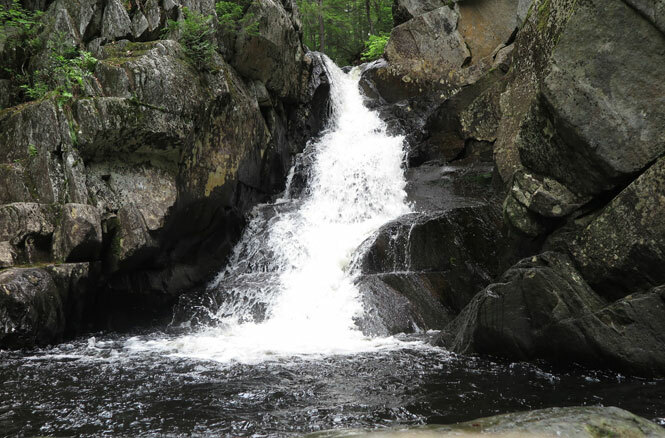 The Cascade Stream Gorge Trails are located in Sandy River Plantation, four miles south of downtown Rangeley, Maine, and just off Route 4 on Town Hall Road. The dirt driveway to the small trailhead parking lot is usually in good shape and should be fine for most vehicles, but it does traverse a short and steep hill so those with low-to-the-ground cars may want to park at the Town Hall on the street below. The trail begins on an easy-going path that soon traverses the rocky mound shown here and then crosses under the power lines. 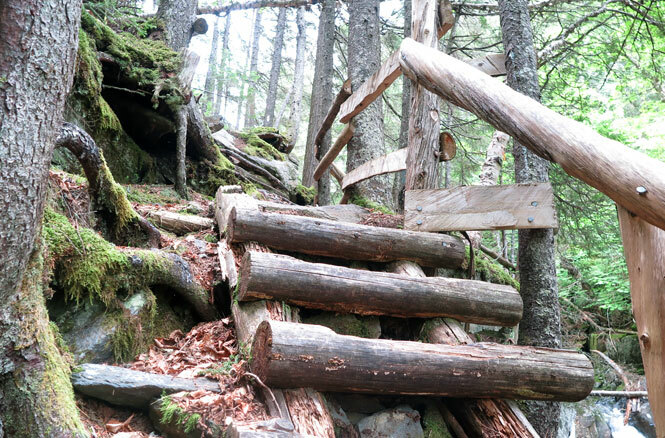 There are lots of rock and rooty areas such as the steps shown here that make this hike challenging but fun for kids. 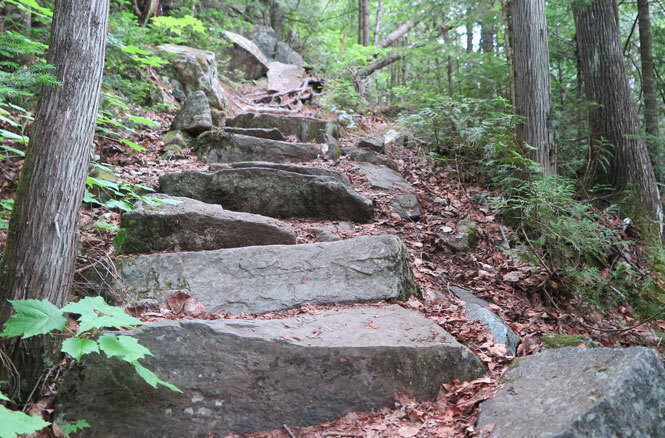 Given the short nature of this hike, it’s tempting to wear sandals; however, the rocks and roots are often wet from water seeping from the hillside, so good traction is essential. The first of the two waterfalls on the Cascade Stream Gorge Trail is reached at 0.2 miles. It’s possible, although often slippery, to get close to the falls. There are also some drop-offs here, so keep a close eye on little ones. The first waterfall is the more impressive of the two. 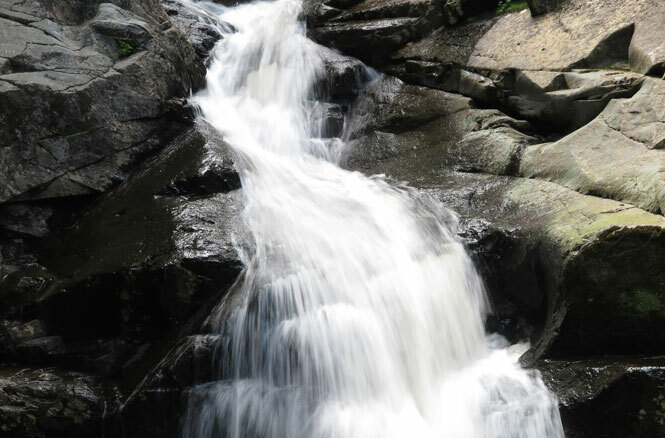 Cascade Stream surges through a chute above before cascading over the cliff below. 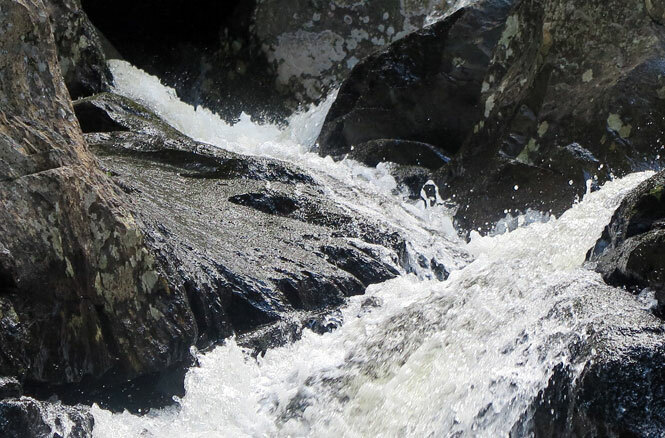 A close-up view of the first waterfall on Cascade Stream. And then the other angle. After the first waterfall, the Cascade Stream Gorge Trail splits in two. 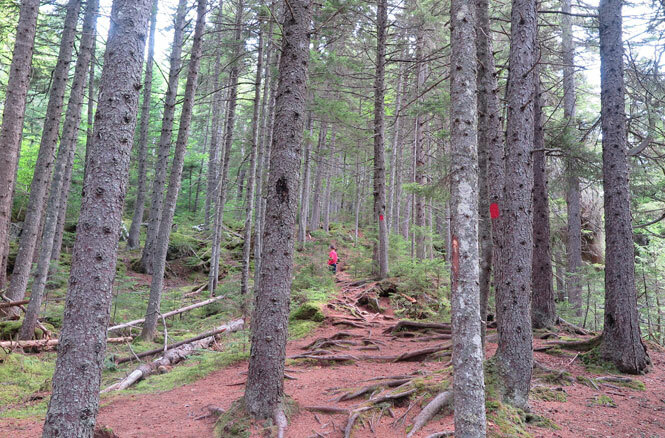 The Red Trail gradually climbs the ridge above the gorge and reconnects with the stream well above the second waterfall after cresting the hill and descending through a logged area. 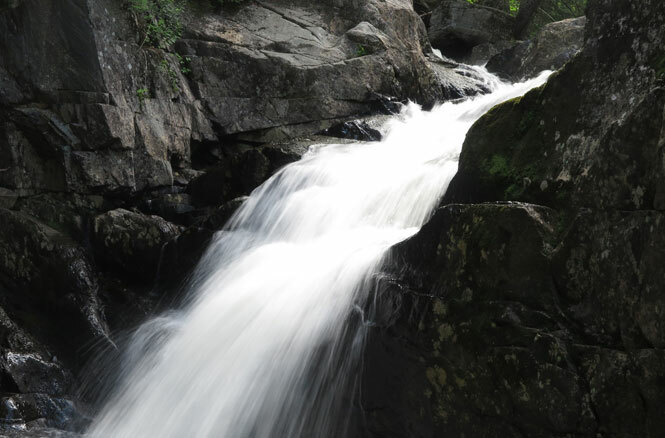 The White Trail goes through the gorge above the stream, leading to the second waterfall. This path is slower going with lots of rocks and roots for kids to have fun scrambling over. 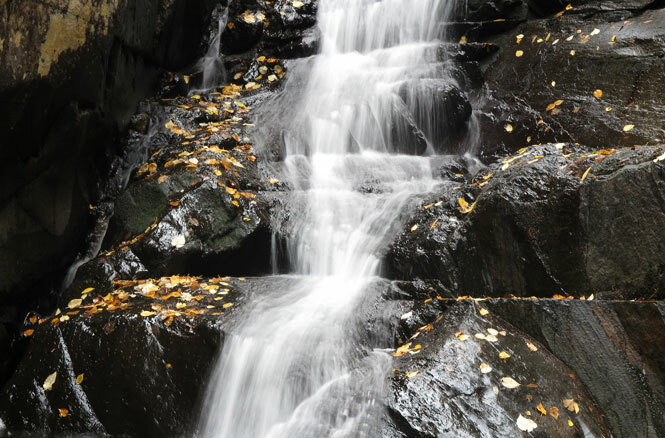 A small spur path splits off from the white trail and descends to the second waterfall, which is reached at 0.38 miles. 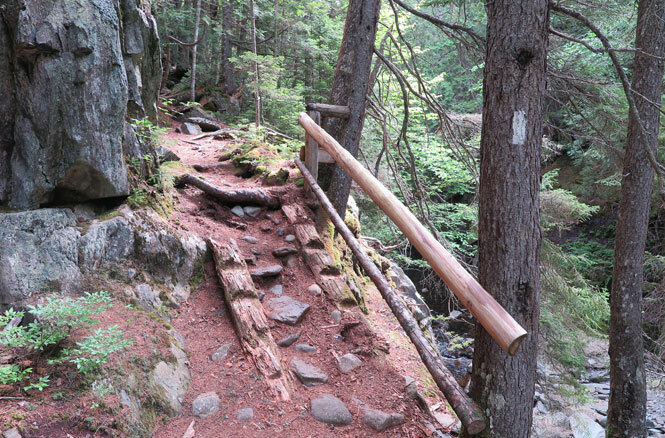 After a large pine tree that has fallen over the trail (squeeze under or carefully climb over), the path brings visitors to the foot of the falls. A good place to cool off on a hot summer day. The first shot of the second waterfall was taken in early July. By comparison, here is an October image so you can see the difference in water flow. It’s a little tricky above the second waterfall figuring out where to go. 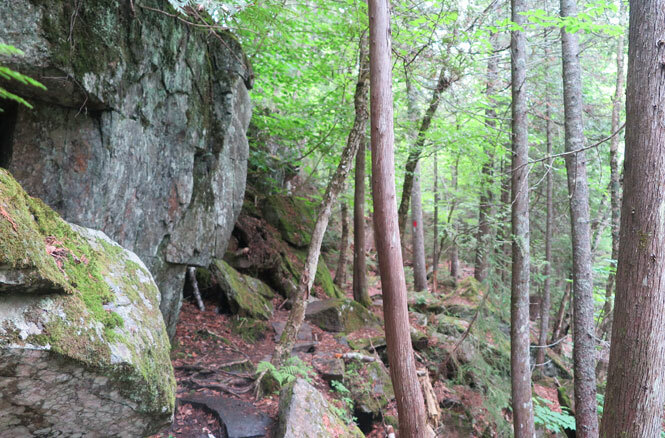 You can see where the spur path used to reconnect with the White Trail adjacent to the falls, but the steps up the ledge have long since rotted out, so backtracking is necessary. Back on the White Trail, there is a sign indicating that you can get to the Red Trail by continuing on the White Trail, which takes you up the steps shown here to the stream above the second waterfall. When the water level is low, you can follow the stream to where the Red Trail comes out. Long story short, there isn’t much to see after the second waterfall, so if you have kids in tow, your best bet is to head back at this point. As always, make sure you watch out for bears!